Glenmorangie just launched the latest in their limited "Private Edition" line, Ealanta, following up on such issues as Sonnalta PX, Finealta and Artein. Bill Lumsden was in town at the Flat Iron for it. No doubt he told the joke that starts: "What's the difference between a bonus and the male organ?" (read to the end to get the punchline - unless you've ever caught Dr. Lumsden's act, in which case you already know). There are "only" 1,500 cases for the US market. 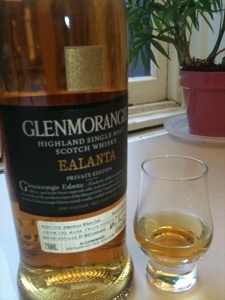 Scots Gaelic for "skilled and ingenious," Ealanta is a 19 Years Old Glenmorangie, matured exclusively in virgin American white oak casks from the Mark Twain National Forest in the Ozark Mountains of Missouri. "Glenmorangie's Bill Lumsden is famous for introducing secondary wood finishing to the Scotch whiskey marketplace. With Astar, however, the focus is purely on first fill American ex-bourbon oak casks and the base whiskey distillate - there are no other sources of flavor going on. But like a great artist who can express much with a single line, Lumsden coaxes an incredible complexity of delightful flavors from these two ingredients." With Ealanta things are taken a step farther. The casks are new charred oak, not ex-bourbon. New oak casks are seldom used for ageing Scotch because new oak adds a spicy note which isn't usually considered desirable. New charred oak is a legal requirement for bourbon - which sits well with bourbon's powerful corn distillate. It's a particular reach with Glenmorangie's extremely delicate juice. But just as Bill Lumsden has been fearless in experimenting with wine casks for finishing, he has been fearless in pushing this experiment in the flavors of pure yard age bespoke oak casks. 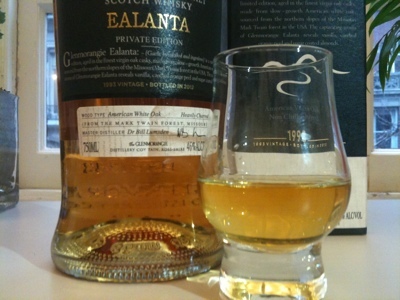 Now, Ealanta isn't the first Scotch whisky to do prolonged ageing in virgin oak casks. BenRiach has had a number of limited expressions aged for as long as 32 years in virgin oak: http://www.benriachdistillery.co.uk/Limited-Releases.html Deanston also makes a virgin oak 12 year expression (and there others out there - slipping my mind). But there is something special about Glenmorangie's performing such an experiment. Partly it has to do with Glenmorangie's extremely high stills - which yield a very delicate spirit - but it's more about Glenmorangie's legacy of wine finishing under Dr. Lumsden. I'm tempted to make an an analogy with Clint Eastwood. 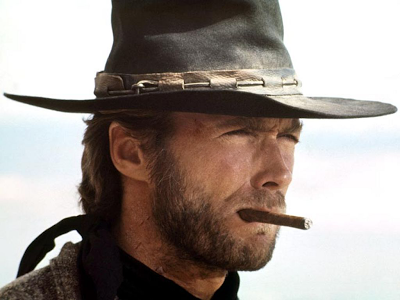 Clint did spaghetti westerns where minor characters were disposable victims of casual ubiquitous violence. In later years Eastwood has made spectacular amends by crafting films that show the devastating effects of violence - even a single violent act - down through generations. Nose: Ripe bananas sauteed in butter and vanilla floral oak in prolific rich abundance, with honeycomb and bees wax. Underneath lurk tangy notes peach/nectarine stone fruit, ambergris, and fresh sawn oak. It's sweet and bright, yet lush in it's own way. 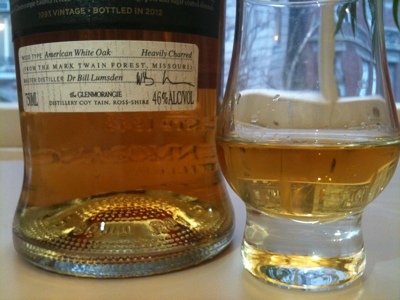 The palate entry is delicate in mouth feel but potently floral sweet on the tip of the tongue, like a young whisky. But unlike a young whisky the sweetness breathes honey, florals, banana and peach fruit essences, and darker hints of mature rancio and chamois rather than grass. Then it tingles the sides of the tongue with stone fruit tang. The mid palate expansion is gentle, more a migration of tongue impact as gentle but rich tannins move back grip the back of the tongue. The finish is fairly long, juicyfruit sweet and tinged with grapefruit tannins and fragrant fruitwood sawdust. With repeated sips the spiciness that starts as a tingle builds up into spicy cinnamon-clove heat. It's new oak, after all, and plenty of it. Would more time have pushed it too far? Probably. I'll take Dr. Lumsden's advice and treasure this dram. Water doesn't add much to this dram, btw. Repeated tastings have only underscored my impressions: it's not a paragon of complexity - but it is a beguiling play on sweet and spicy oak and sweet Glenmo distillate. I'm smitten. A word on value. This one is going for $110-$120 in the US. This is just about the same price as the excellent OB 18. Given that this is a limited edition and is aged for 19 years - this is clearly in line with Glenmorangie pricing. It's not a value priced dram - but it's a notable success as an experiment and an unusual and appreciated flavor signature. Oh, and the punchline of Dr. Lumsden's joke? "She certainly knows how to blow a bonus!". one of your best review, Coop! it makes me whish we had some up here! Thanks so much JF! I'll have to save you a dram for when I finally get up there one of these days. Nice write up josh. i've been itching to try this. hoping they'll have it at go whiskey weekend tomorrow. I'm very jealous about you going to that Julio's event. I wish I were going to be there. I know Chip Tate & Winston will be there. Enjoy. I'll be doing my whisky-chocolate pairing at The Morgan, though - so I'll be having a good time. Thanks for this. Have been considering it. Any thoughts in the Deanston? I haven't tried that Deanston. I've had the regular Deanston 12 at Whisky on the Hudson last autumn and enjoyed it much more than my memories of cheap Deanston in the 90s. I haven't run across the limited editions around here. Have you tried it? So, if Lumsden came on board in 1995, these casks already would have been aging for a year. I wonder whose decision it was to use new oak, then. I don't know who was master distiller at Glenmo before Lumsden. I'll find out because they are an unsung architect. I notice that the first round of Port, Madeira, and Sherry cask finished Glenmos were released in 2004 - also just before Lumsden came on board. Sounds excellent. And I'm aching to try the Nectar D'Or too. I only have the Lasanta and the Quina Ruban at the moment. The Lasanta & the Quinta Ruban are the rebranded labels for the Sherry Wood and Port Wood finished Glenmos that date back to the mid-90s. They are classics - the Port Wood finish particularly. Definitely get your hands on the Nectar D'Or. It's light and gentle - but it opens up to an effusively floral beauty. Its the lead-off dram at my whisky-chocolate event this Friday (paired with expensive, exotic Pacari Piura 70%). Nikka Taketsuru 12 graces the USA at last. Russell's Reserve hits the nerve... with verve.